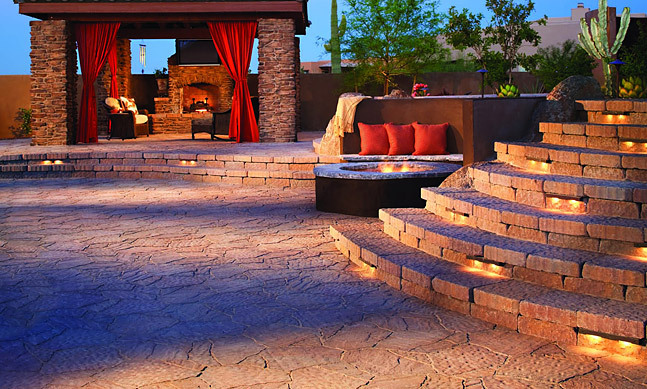 Low voltage landscape lighting brings your landscape to life even after the sun has gone down. Today's homes have become a place to relax and enjoy your family and friends. What better way to show off the pride that your landscape brings, then to be able to accent the areas of your lawn that you enjoy the most. 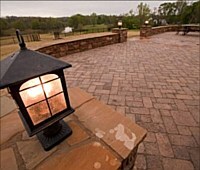 Another added feature of landscape lighting is that it provides security to your home. Your residence is a reflection of you, and what better way to add to the curb appeal of your home then with a paver patio or driveway. Pavers are both more aesthetically pleasing, and easier to repair than concrete. If you are looking to make your home more environmentally friendly, then you should consider Pervious Pavers. Pervious pavers are environmentally friendly, and they also add to the pervious space of your property. We highly recommend low-voltage lighting for commercial spaces. However, it is also a great type of light to use for residential properties in Georgia, especially for outdoor lighting. Unknown to many, low-voltage lighting is also cost-efficient and energy saving. Its quality illumination is perfect for use in the outdoors because it has beaming and dimming capabilities which could add drama and increase the ambience of any outdoor space. This can also be installed without the clutter because it is smaller compared to traditional lighting fixtures. Another good thing about low-voltage light is that it has a longer lamp life than a traditional light. Dimming it might even make it much longer. Because of this, disposal of low-voltage light waste is kept to a minimum. There are many types of low-voltage lights which could be used for outdoor lighting. There are those that are great for highlighting certain features within a landscape or garden like uplights, downlights, accent lights, silhouette lights, shadow lights, and spotlights. There are also those which help create special effects in a landscape's design like cross-lighting, wherein various lights are strategically placed to make their beams of light cross each other, thus creating a three-dimensional effect on the features and on various surfaces. Then there are lights that are used to provide illumination for safety and security, such as path lights and spot lights. Meanwhile, special lights are designed for specific use like submersible lights, which could be installed within a pool or a pond or for any water features for that matter, which are meant for additional lighting and effect during nighttime. Four Seasons Landscape Management has a team of expert and certified technicians who can install any type of outdoor lights. They follow certain standards for safety without compromising the aesthetic appeal that these lighting fixtures can provide to your landscape. You can definitely rely on our outdoor lighting fixtures and installation services. We can handle low-voltage lighting installation or any type of lighting fixture that you might prefer. Do not let darkness hide the beauty of your landscape. You deserve to enjoy it with family and friends all day and all night. Plus the safety and security it provides will be very beneficial for you and your guests. 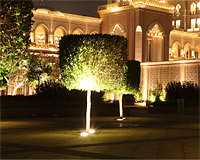 Talk to us and we would be glad to discuss the various outdoor lighting options with you.